This is a fabulous send-up of your usual monster movie. Man wants to benefit mankind through science, something goes horribly wrong, man is now cursed to transform into being that stalks and destroys the people he was trying to save. Though in this case it’s vegetables. The movie is set in a sleepy Yorkshire village where everyone is trying to win the prize vegetable competition. The send-ups and parallels of other famous monster movies like The Wolf Man, King Kong, and Dr. Jekyl & Mr. Hyde are brilliant and well worked in. Gripping dramatic camera shots, haunting music and brilliant animated expression add horror and gravitas to a very silly story. 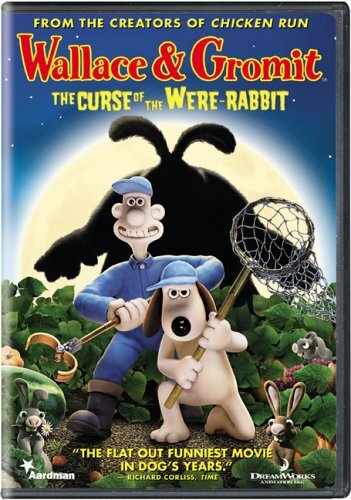 My favorite is when Gromit comes across a mass of half-eaten vegetables and the camera gives you a graphic shot of pulp and seed and juices, while the orchestra goes nuts, and Gromit reels against the door, overcome by the senseless destruction. You can almost just imagine that a half-eaten squash is as horrifying to him as a bloodied broken corpse. It’s really well done and a great movie to share with the family.